Short for 'proliferative' therapy, prolotherapy is based on the same naturopathic philosophy that the body has the innate ability to heal itself given the appropriate stimulus. The stimulus, in the case of prolotherapy, is through the injection of a 'proliferant' solution which causes a controlled/localized tissue trauma. The body responds to this trauma by initiating a wound healing cascade. This process is thought to repair the damaged tissue in a such a way that results in stonger tissue integrity. These injections are applied to the musculoskeletal structures of the body, particularly at the weakest point of joint spaces where the tendons/ligaments connect to the bones. This, in turn, stabilizes the joints which takes stress off of the musculoskeletal structure, relieves muscle spasms, reduces inflammation, improves strength/biomechanics, and so forth. Ultimately, the combination of these results helps to relieve pain and prevent injury. Injections are applied precisely to specific regions of the body based on a thorough orthopedic assessment. What is used in the Prolotherapy Solution? Dr. Kopcio uses the Hackett-Hemwell solution, as taught by the the Hacket-Hemwell Foundation and the American association of Orthopedic Medicine. The solution is a mixture of lidocaine (numbing agent), dextrose (sugar solution) and a small amount of B12. Dependent upon the area treated other solutions may also be used such as sarapin (analgesic), Marcaine (numbing agent) and sodium chloride (salt water). Can Prolotherapy Repair Cartilage? Prolotherapy has a proven track record in the treatment of damaged articular cartilage associated with osteoarthritis. Studies have demonstrated the ability of Prolotherapy to regenerate and repair damaged cartilage, reduce pain and improve functioning. It is important to note that Prolotherapy will not regrow cartilage if there is none left in the joint. Is Prolotherapy the same as Nonsteroidal Anti-Inflammatory Drugs (NSAIDs)? They are definitely not the same. Prolotherapy does the opposite. Nonsteroidal Anti-inflammatory Drugs (NSAIDs) are commonly used to treat osteoarthritis. They have a large number of negative side effects and a negative effect on the cartilage between the joints. NSAIDs also cause an acceleration of deterioration of articular cartilage and therefore cause increased osteoarthritis. Absolutely not. Cortisone is a steroid and stops the inflammatory process and prevents tissue healing. Over time, it will actually damage the joint more. Cortisone restricts blood flow to the area needing to be healed. Prolotherapy increases the blood flow to the area bringing in oxygen and nutrients to help heal the damaged tissue. 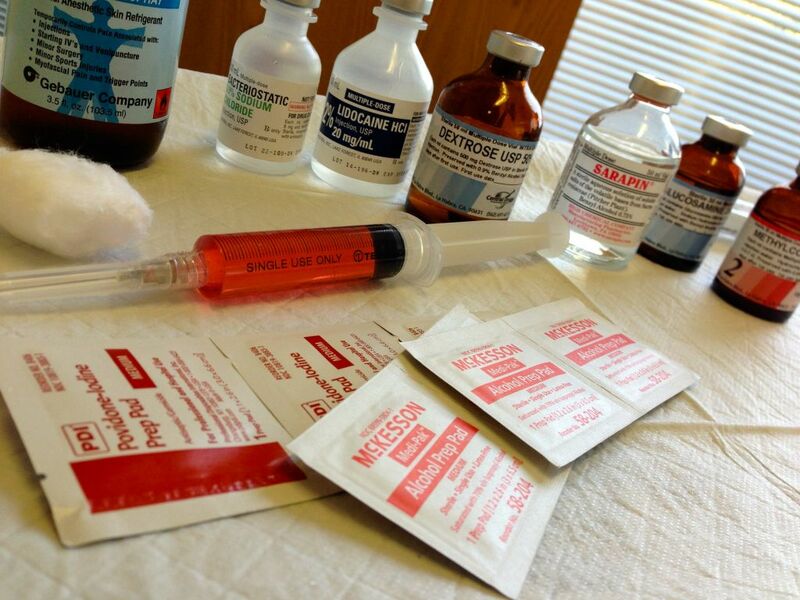 Cortisone is not part of the Prolotherapy injection. Prolotherapy has been practiced for over 60 years and is an extremely safe procedure when performed by a trained Prolotherapy doctor. It is important to ask the qualifications of the doctor when choosing who to perform the procedure. Sterile procedures are always practiced and each patient’s condition is unique and individualized. Maybe is the simple answer. Dependent upon each patient and their individual condition, the amount of discomfort varies. Some areas are more painful than others, and everyone’s pain response is different. Of course it can’t. No single treatment is capable of treating all pain conditions, and Prolotherapy is not an overnight cure. That’s why we do a thorough evaluation and assessment of each condition before recommending Prolotherapy as a treatment option. There are also things you can do on your own to enhance the procedure. Prolotherapy results can be enhanced when combined with exercise, proper nutrition, restricting activities, and balancing hormones. At Phoenix Natural Doctor, we can also combineProlotherapy with other treatments such as Chiropractic, Acupuncture, and Low Level Laser to enhance the healing process. The number of treatments required depends upon the severity of the condition and the area treated. The average person usually requires 4-6 treatments, with some needing more and some needing less. Treatments are normally given once a week for 3 weeks and then spaced out based on how the person is responding to the treatment. This plan is varied on a person by person basis. More than one painful area can be treated during an office visit, and many patients report partial or complete relief of their pain after one or two treatments. Side effects of Prolotherapy injections may include temporary soreness, stiffness, and occasional bruising in the injection site. Non-inflammatory over the counter pain medication such as Tylenol may be taken, or prescription non-inflammatory medication can be provided. Homeopathic preparations such as Arnica can help with these effects as well. You do need to avoid anti-inflammatory medicines for at least 72 hours following treatment. 1. Chronic pain is not well understood and Prolotherapy is not taught in most medical schools. Unless a doctor has taken the extra training required to be an effective Prolotherapy doctor, they may not be aware of the beneficial effects of Prolotherapy. 2. The entire procedure may take up to an hour and many clinics cannot afford to take this amount of time for one patient. 3. Many doctors and patients want a “quick fix” as provided with medications. These types of fixes do not heal the area causing pain, but mask the pain and allow for continued damage of the area. 4. Most insurance companies consider it “investigational” and “alternative” even though it has been around for over 60 years, and Prolotherapy is usually not covered. Many patients use their HSA or flex spending to get it covered. It is possible to send in a claim and try to be reimbursed. Phoenix Natural Doctor will provide you with a superbill and all necessary coding to submit the claim yourself.